The Spring show house season is in full swing, and one of the nation's longest running show house events is the St. Margaret's Hospital Guild Decorators' Show House and Gardens in Indianapolis. Founded in 1907, St. Margaret's Hospital Guild raises funds for Eskenazi Health Services. This year, the guild will be organizing and hosting its 54th Show House. I'm honored to be speaking at the event's Pink and White Party on Friday, May 1 at noon. The party will honor survivors of breast cancer (the "Pink" referred to in the party's title) and pulmonary disease (the "White"). In addition to my lecture, there will also be a tour of the Show House. Tickets for the Luncheon Package, which include a lunch presentation and tour, are $45. Or, you might prefer the Patron Package at $75, which means you will also be able to attend a Champagne reception the evening before at Charles Mayer & Company, one of Indianapolis's most stylish stores. I will be signing copies of my book at the Champagne reception. St. Margaret's Hospital Guild is looking forward to your visit to Indianapolis for the 54th Annual Decorators' Show House. 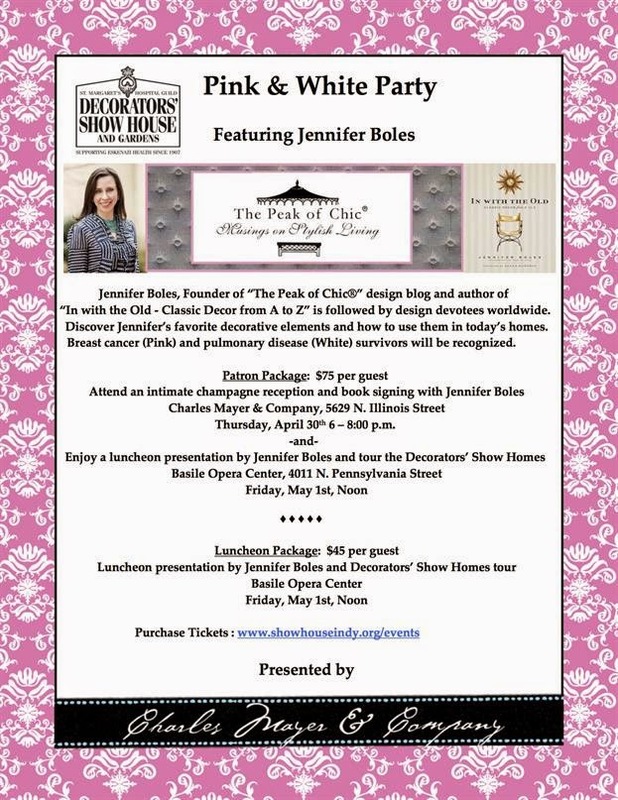 We're delighted to have you as our featured speaker at The Pink & White Party, and are eager to hear about your favorite decorative elements and musings on stylish living!